If you have juniors ages two to five, you probably have tried various ways to teach them how to tell time. You might even have tried several apps to help them learn about time. Today, I am reviewing a brand new app from Seven Academy, titled Tic Toc Time, that tries to teach juniors about this topic in a more step-by-step pedagogical approach. The set of big stones encircling the big tree helps juniors to learn where the shadow's location is during different times of day. The entire learning curve of the Tic Toc Time is divided into five stages. The first stage is called The Compass because you will learn how to use a compass along with cardinal points (North, East, South, and West) and how they relate to the sun's movement. Nathan the friendly Canadian Beaver will be accompany you in your learning. You start by placing letters representing cardinal directions (N/S/E/W) to construct the compass. Then, you can pick up the iPad, stand up, and face a different direction to see how the compass reflects this change. Once you get the hang of it, the app teaches you that East is where the sun rises in the morning, and West is where the sun sets in the evening. You will also see what Nathan and his family do in different times of day. The second stage of learning is called The Sun and The Shadows. You start by moving the sun from morning to evening. As you move the sun, you will see a big tree on the center of the screen. It's so big that it blocks the sunlight from reaching certain areas near it, creating a big shadow. As the sun moves from East to West, the shadow changes position. 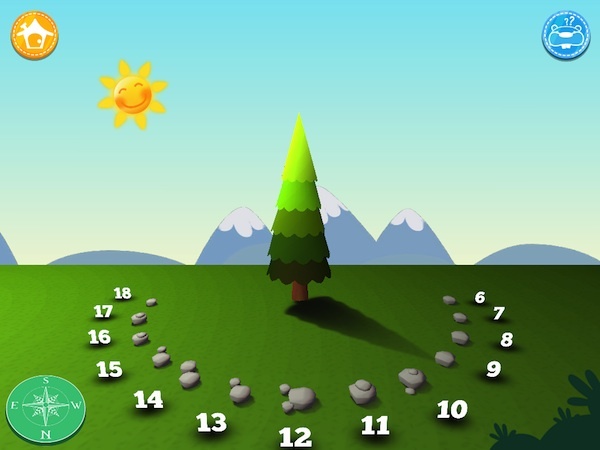 Then, the app shows you a set of big stones encircling the big tree. The stones are numbered from 6 to 18, each representing where the tree's shadow would be located when the sun reaches that time of day. You will learn how to correlate the sun's movement and the shadow it creates during different times of the day. However, the app doesn't show you what happens at nighttime. This is when you step into the next stage of learning: Time from Space. In this stage, you can see Earth's position from the sun's perspective. As Earth rotates, you will see Nathan and his family move from 6 AM to 12 PM, and then to 6 PM and 12 AM. This shows a big difference between morning, noon, evening, and midnight. You will see that while the Earth rotates, the sun doesn't. This illustrates how you get to experience day and night within a 24-hour timeframe. Next, the app shows you a zoomed out version of the sun's movement that causes the shadow to appear surrounding the big tree. As you move the sun from 6 AM to 6 PM, you will see the exact same shadow from the previous activity. But as the sun enters nighttime, the tree no longer receives sunlight. Once you're familiar with the sun's movement, the app teaches you about AM and PM. A nice animation translates the 24 dots representing the sun's movement relative to the earth into two equally-shaped circles of 12 dots. The circles are combined to create an analog clock. This animation helps to explain why there are only 12 numbers, instead of 24, on an analog clock. Learning about the sun and the shadow from an outer space perspective helps to explain why there's no light at nighttime. The fourth stage of learning is entitled Play with the Clock. You start by learning how the small hand of an analog clock represents hours by rotating it to fit the time shown by its digital counterpart. Then, you learn how the big hand represents minutes. You start from quarters of an hour to a more fine-grained time of day, such as 1:36 AM. You will also learn about terms that are commonly used to tell the time, such as "half past two" and "quarter to six". Once you have mastered this, the app asks you to identify the correct clock face among four options without the aid of a digital clock. As a bonus game, you get to play The Clock Challenge. It's a timing game where you need to tap the big red button on the center of the clock when the analog clock shows the exact time of its digital counterpart. The challenge gets harder as the minute hand moves faster. The analog clock in Tic Toc Time is designed to use two basic colors, blue and red, to make it easier for juniors to grasp the concept. 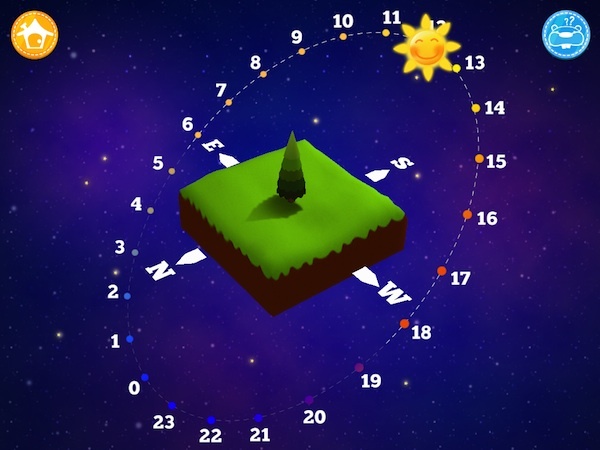 Tic Toc Time is the first app I've seen that teaches about compass, the sun, shadow, and their relation to time. Instead of forcing juniors to learn about analog clock, digital clock, AM/PM and other terms that adults are familiar with, the app uses a step-by-step, pedagogical approach. Everything you learn is done one step at a time. I didn't thought that the simple act of putting the N/E/S/W labels on a compass would lead to learning about the sun's movement. The same is true when the app shows how much you can learn from shadows. Even when a shadow is no longer visible, you can still learn about how the earth's rotation causes an individual location to be hidden away from sunlight. In the Clock Challenge, you try to hit the bumper as the minute hand passes the time in question. When learning about analog clock, referring the hour hand as short/small hand and the minute hand as long/big hand sometimes is not clear enough for younger juniors. Tic Toc Time uses two basic colors, blue and red, to mark the visual difference. Red is used to represent the short hour hand, the hour part of the digital clock, and even the 12 numbers on an analog clock. Blue is used to represent the long minute hand, the minute part of the digital clock, and the 60 small dots on the analog clock. This makes it easier for younger juniors to associate digital clocks with its analog counterpart, and vice versa. The developers also put a lot of attention to the app's details. For example, in many of the games, the background changes to reflect the time of day. While this is not necessary, it's certainly helpful for juniors to understand the context of the time in question. Finally, as a parent, you can sign up for an account to have the app track your juniors' progress and send you a customisable email alert. But the best part is that you get access to play in Green Academy's Montessori Garden. It's a virtual garden where you can play a fun farming simulation game using the rewards that you get in Tic Toc Time. It's worth the signup process, indeed. 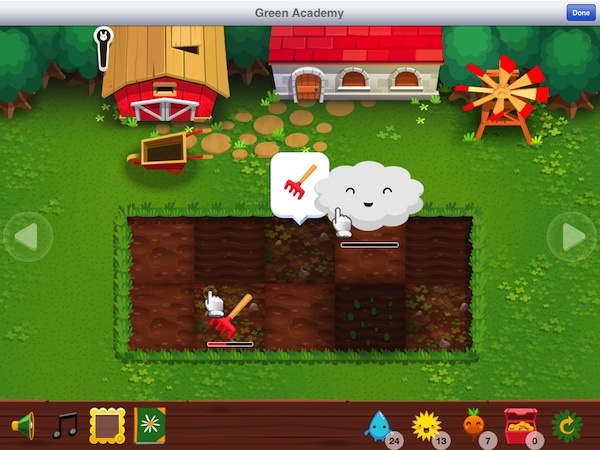 Green Academy's Montessori Garden is a virtual garden where juniors can play a farming game with the in-game rewards. Tic Toc Time is more than just an app that lets juniors learn about the time of day. It's a discovery game that lets you discover what makes our day it is. It's one of the best science-themed apps for younger juniors on the App Store. I'd highly recommend it for juniors who are learning how to tell the time. Around the Clock. Fun toy app introduces kids to the different hours in a day. Sakura Time. Practice your time-telling skills in this beautiful, fast-paced app.